Smaller countries lead the way. When you think of 'high-tech', which countries come to mind? Before continuing, what is meant by the term 'high-tech'? 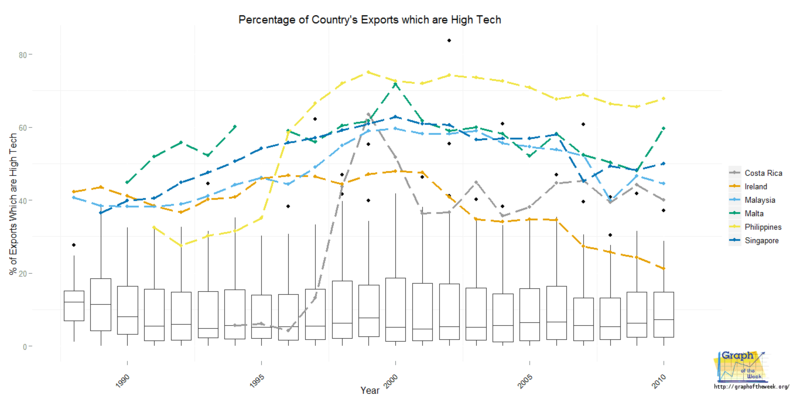 As defined by the World Data Bank, high-technology exports are products with high R&D (Research and Development) intensity, such as aerospace, computers, pharmaceuticals, scientific instruments and electrical machinery. That doesn't necessarily mean 'end products' - the gadgets, drugs, meters, etc. that end up in your hands for use; rather, it often means the parts or chemicals that go into those devices which are often assembled elsewhere. We tend to associate that term with countries such as Japan, the United States, Great Britain, the Nordic Countries, France, India, Taiwan and China to name a few. It's reasonable to make that assumption because those countries do indeed export high-tech products in large amounts. However, that's not the only thing they export since most are large enough to diversify. Therefore, when we look at their high-tech exports as a percentage of their total exports, it mostly rises no higher than 30%. 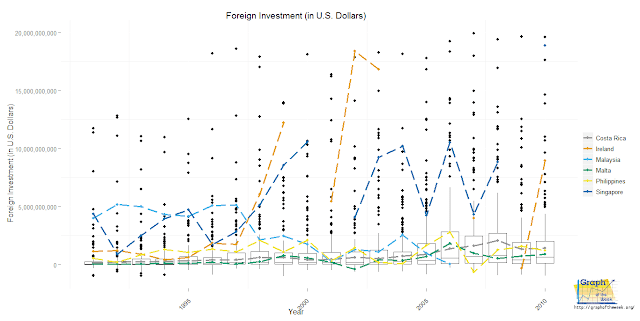 Foreign investment which brings in much-needed capital. Local jobs which lowers unemployment. 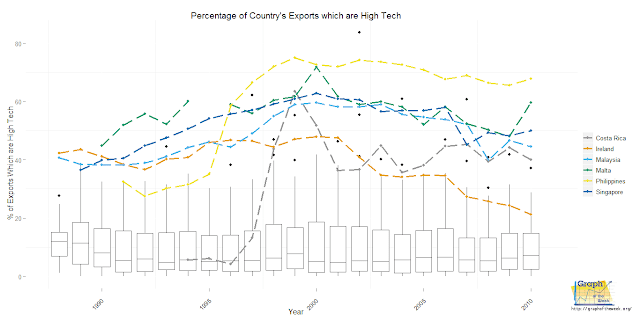 Take Costa Rica, for example: prior to 1995, they had virtually no exports in the technology sector. However, since they offered tax exemptions for those willing to invest in the country, several technology-based companies have begun to develop in the area such as Intel and GlaxoSmithKline. Looking at the above chart, it is plain to see how smart, smaller countries are embracing high-technology and using it to gain a foothold in the global market. 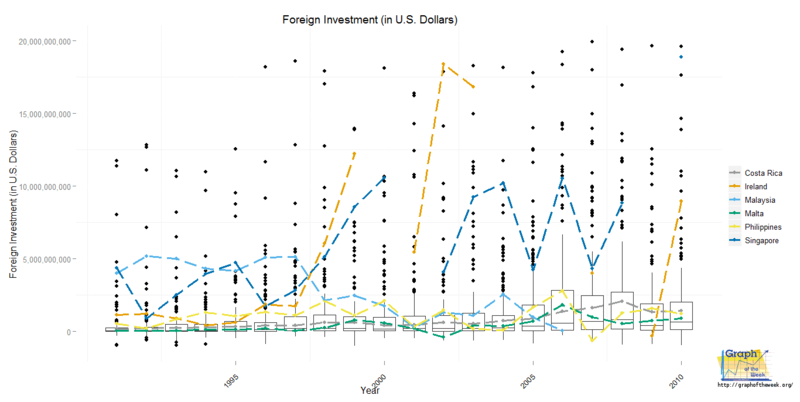 Do the countries shown above also show healthy foreign investment as argued above? Look at the graph below. Most of them are in the upper echelon with some having significant investment from abroad. It is interesting to look at Ireland in this scenario. Given that country's other problems, even their high-tech exporting business suffered mightily, which suggests that some problems are just too large to overcome by being smart investors. These high-tech exporting countries attract foreign investors. Have these same countries seen an increase in local jobs due to producing high-tech exports as argued above? With the exception of Ireland, these countries are looking good. In addition to the 'Next Eleven', this author is suggesting that the other five countries highlighted here should also be included when making rosy economic predictions due to reasons described above (with Ireland a possible exception until they get their problems straightened out). The only country showing problems recently is Ireland for reasons cited above. No matter what data you have on hand, however, sometimes situations come along that ruin the party. When the world economy takes a dive, it tends to affect everybody. During the global recession in 2008, nearly everyone was affected which can also be reflected in the above graphs to a certain degree. However, the high-tech industry was amazingly resilient and only dipped a little. That being said, it would be prudent for these countries to diversify, thereby bolstering their ability to withstand global financial downturns. Presented here are several examples of smaller countries gaining a foothold in the global economy via high technology exporting. While it doesn't guarantee success, it does trend towards a robust economy for those countries willing to take the risk. When other extenuating circumstances are not intervening (as noted with Ireland), these countries seem to exhibit stable economies. This is not to say that other types of exports would not also produce a similar effect; only high-tech exports were examined here. For those smaller, struggling countries, they might consider allowing foreign investment to bolster this sector - it certainly seems to net positive gains. 1) Many of the countries highlighted here are island nations - coincidence? 2) Will other small countries follow suit and allow foreign investment in this sector? 3) What other types of export allow for a resilient economy? Ireland is tricky business ... the IFSC (Ireland Financial Services Centre) debuts 1987 to lure foreign investors with 10% corp tax rates ... Dell opens in 1991 ... Dell integrates some of their portfolio Asia supply chain partners into Ireland via acquisition of Ireland Companies of through relocation to Ireland ... 1993 Gateway Computers also opens in Ireland ... it is noteworthy that Dell had many imitators as the benchmark for an Industry ...hence, many Tech Companies follow Dell into Ireland. Note the uptick on the chart. Some 8 years later ... Gateway exits Ireland in 2001 ...IFSC phases out tax incentives until they are all phased out by 2008 ... Dell exits at end of 2008 and relocates to Poland. It is likely the drawdown didn't happen overnight ... the IFSC started to phase out incentives beginning in 2003 and the chart notes a gradual decline beginning in 2007. It is also worth noting that your data may need additional scrutiny around the following area: Ireland did build and export Dell's and Gateway's ... however, it is more likely that they were the Shipping Hub to Europe for High Tech built in Asia which was exported to Ireland to a Supply Chain Hub and then on-forwarded to Europe. The IFSC made Ireland a very attractive destination as a Finance Hub as well as a Shipping Hub. Excellent comments - thank you for your detailed insight into the factors surrounding Ireland. Question: why did the IFSC phase out tax incentives? In response to the building and shipping in Ireland, I mentioned that exports didn't 'necessarily' mean final products. That was an attempt to ensure an understanding that not all exports are final products. The problem with this approach is that, these countries aren't exporting; they're middling: acting as domicile tax havens for large foreign corporations. These countries are really middlers; the products aren't made with indigenous resources, so they aren't exports, and they're not consumed domestically, so they're not imports. Costa Rica exports bananas, a product which the citizens (with a good deal of foreign control, even so) make. You didn't include the granddaddy of all, Bermuda, where I've been. The Bermudian citizen doesn't participate in these "export" activities; they must be content to "serve" the ex-pat foreigners who get all that money. Whether the Bermuda citizen is happy with the bargain is very much up in the air these days. You can follow the story, on-line, in their newspaper, The Royal Gazette. I expect that these other island nations, more or less, conduct the same debate. Do the citizens of these nations get any material benefit from the bargain? Better health care? Better housing? Better schooling? Access to professional employment in these activities? From what I saw in Bermuda, no. These activities use up land and water, both in limited supply on islands, to little or no benefit to citizens; well except landlords. Such deals are with the devil. As soon as XYZ Corporation manages to extort a better deal from some other island nation, off it goes. The same thing, very same, happens here in the USofA with professional sports franchises: they extort cost free arenas with the promise of wonderful jobs for many citizens. Doesn't happen, and soon enough, off the teams go to yet more gullible cities/states. The solution, following Malthus and Ehrlich, is for such island nations to stop having so many damn kids (that's a paraphrase from Paul Theroux). There's no future in being a temporary tax haven. Bermuda: the World Data Bank has absolutely no data on that country with regards to high-tech exports, so that's why they weren't included. Unfortunately, when doing 'data journalism', my charts/graphs (and corresponding insights) are only as good as the data I use. In this case, the World Data Bank is fantastic, but even they cannot gather data from all countries (imagine trying to get numbers from N. Korea!). If you have a solid data source - where the data is actually downloadable, testable and analyzed for errors - then please direct me to it. Material benefits: If unemployment goes down in a country, then I can only surmise that money must be coming in. What those citizens then choose to do with that money remains up to them. 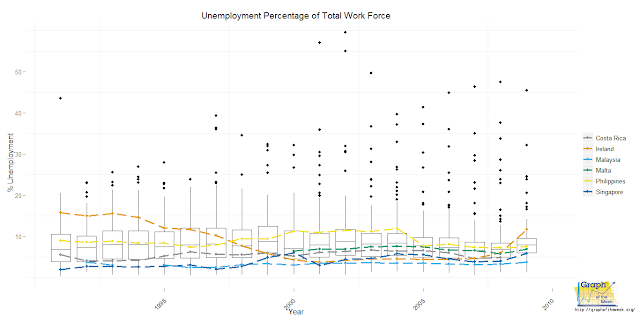 Further, since unemployment is going down in these countries, then it follows that the locals are being employed. I do not know which jobs inside of these companies they are getting, of course. That would change constantly and require an investigation. That being said, I absolutely see your point of view - these jobs are not in control of the locals and therefore do not control their own destines/salaries/happiness in that context. It's one thing to see a statistic that says jobs are up, it's something else entirely to actually be there and see the working conditions. Patrick, what U.S. corporations are investing in those countries? And when they do, how does it impact the U.S. workers? Exporting jobs/outsourcing by Transnationals/Multinationals generates globalized profits for their CEOs and loss of U.S. jobs. Also what are the workers being paid in those Transnational workshops? What are the regulations on those TNs--like Environmental, Health & Safety, Taxes, etc?? Discussion referenced with graphs and sources. Justification for CEO profiteering per their view is based on entitlement, claiming it's their imput that makes success. Well...what about the workers who actually produce the product? I hear ya - loud and clear. This article was simply to illustrate that small countries are growing due to foreign investment coupled with high-tech exports, thus ensuring they stay viable. Without foreign investors and the accompanying technology that comes with it, they (the small countries) are typically stuck, so they don't have much of a choice. The workers in those countries can either continue to not work at the 'high-tech' factories or take a job there - either way they are no worse off. There are downsides for the U.S. as you mention and perhaps that should be a future article on this site. The companies mentioned in the article (Intel and GlaxoSmithKline) are huge and employ tens of thousands here in the U.S. as well as abroad. In order to keep jobs here, the barriers to starting a small business must be lowered (I know this from first-hand experience), then those that think jobs should stay here can create them. In other words, more small businesses and less huge ones will definitely level the playing field. 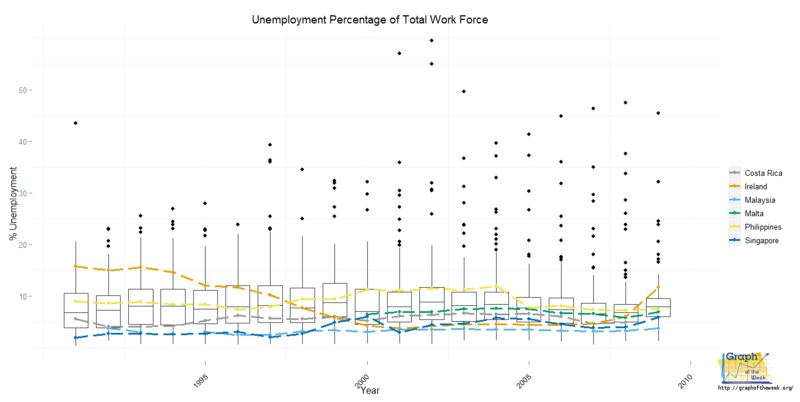 That is a great paper, but sorely in need of graphs! I like the published formulas.